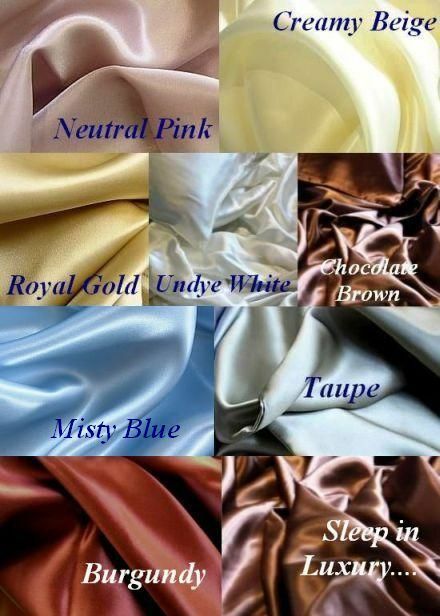 Home | Silk dream | 4 pcs 100% mulberry silk charmeuse sheet set-Direct Import Price, Free ship US! Spring Sale !! All silk sheet set purchase made on or before Easter Sunday 4/21/2019 gets $30.00 off with discount code: discount30 Hurry before coupon expired !! Text us at 626-297-8668 for questions and quick answers !!! Spend 1/3 of your day in true luxury....enjoy pampering sleep on our pure 100% mulberry silk sheets...lowest seamless 19 momme silk sheet price on the internet with quick shipping from Los Angeles U.S.A.
Made of top quality heavy 19 momme weight (if weight is less than 19 momme, silk is too thin for sheets, if higher than 19 momme, it is too thick and too expensive) 100% mulberry silk (pure silk that comes from silk worms that fed on mulberry leaves)in glamorous charmeuse weave. Each Sheet set has 4 pcs: one flat sheet, one fitted sheet and two pillowcases. (For individual fitted or flat sheet ,5 pcs set that includes a duvet cover, twin or twin extra long sheets please click on link at bottom of page )The sheets are seamless. Fitted sheets are deep pocket with elastic all around and can accommodate mattresses up to 17" deep. Machine washable in cold water and machine dryable using delicate cycle, no bleach. Must be sure to use mild detergents such as woolite. Not only our top Grade 6A 19 momme, 450 thread count long strand mulberry silk is of a much better quality than most silk sheets on the market it is half the price too because as a direct importer we cut off the middle men and offer direct import price to you. The sheets are on Sale now, don't wait as price of silk is going up!